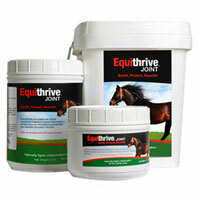 Equithrive Joint is a unique resveratrol-based formula that supports healthy joint function in your horse. Equithrive Joint is a stand alone product that does not require co-administration of any other nutraceuticals or supplements to support soundness and continued joint health in your horse. It is a powdered product that can be administered with a horse’s daily feed ration.